Hide yo’ trust funds, hide yo’ checkbooks. If you thought the RS7’s 560 horsepower was a little tame, then Audi speaks your language and has quelled concerns with its new performance package. The package adds 45 horsepower to top out at 605 horses and torque temporarily climbs from 516 lb-ft to 553 lb-ft with its overboost function. 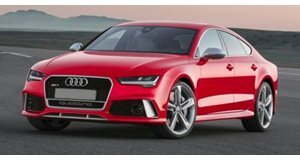 The added power and Quattro four-wheel drive system enables the family cruiser to hit 60 miles per hour in 3.7 seconds, 0.2 seconds faster than the standard RS7 while maintaining its 25 miles per gallon economy rating. If you’re off your meds when you spec the performance package you may opt for the dynamic package, which removes the 155 mph limiter and lets the car hit 190 mph. Add-ons include a larger air intake, a new front bumper, a bigger rear diffuser, and matte titanium trim to make the car really pop. Impressively, Audi cranks out this extra performance while maintaining fuel economy by using the same 4.0-liter twin-turbo V8 with a cylinder deactivation function. Unfortunately, these upgrades don’t come cheap. Expect to pay $28,000 over the $108,000 base price for a headache-inducing total of $136,000. The upgraded Audi will debut in Germany by November and will make its way to US shores soon after.